Heat the oven to 200°C/180°C fan/gas 6. Heat a glug of oil in a large frying pan over a medium heat. Add the onion and cook for 5 minutes. Add the garlic clove and harissa paste, lightly season with salt and pepper and cook for 2-3 minutes more. Tip into a large mixing bowl withthe lamb mince, egg, feta and a large handful of chopped fresh coriander. Mix everything together with your hands, season and shape into 4 large patties. Put the patties on a lipped non-stick baking tray (they give out a lot of juice) and bake for 30-35 minutes until the lamb is cooked through. 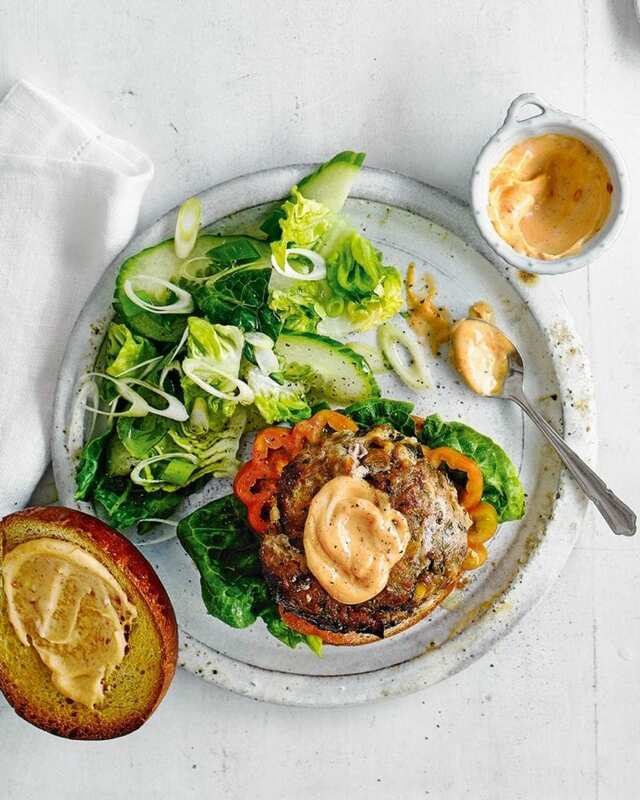 Toast the brioche buns, then layer each base with 1 lettuce leaf, 1 slice of tomato and 1 slice of cucumber, then the burger. Mix the mayonnaise with the harissa and add a dollop to each. Top with the other half of the buns and serve with salad leaves, sliced cucumber and spring onion, if you like.